Blue Harvest, Planet Ice, Magnus Rex, Star Beast, Black Mask, Group Hug, Changing Seasons, Grand Tour…. are all working titles for major Hollywood blockbusters in the past. A working title is the temporary name that is given to a project during its development. The event we all participate in is a creation we all make happen, and an experiment on a grand scale. A city teeming with gifts, where we emulate, collaborate, imitate, and absorb inspiration from each other. Who knows what we will encounter, what magic we will make, and what fantastic productions will come from our communal efforts? Who knows what incredible idea, a year’s worth of blood, sweat and tears will culminate in? Who knows how many different evolutions, and transformations every project, artwork and performance will undergo by the time we all regroup in Tankwa Town? The word “work” is in “Working Title…”- and the desert experience was never meant to be easy, or a holiday. This gathering requires every citizen of Tankwa Town pitches up and pitches in. 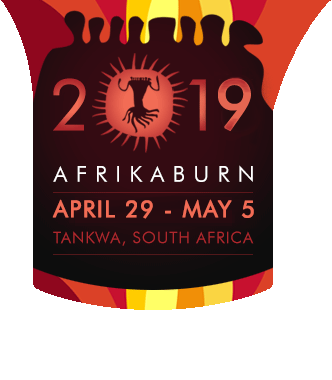 Your participation is what creates AfrikaBurn and you are best suited to know what the end result of your singular or communal endeavours and personal challenges will produce. What are your skills? Where are you focused? How are you specialised? Do you define yourself as a story-teller? An instructor? An engineer? A cartoonist? A cartographer? An organ player? A monkey? What is your ‘working title’, and how will your designation transform what we all do in the Binnekring? This is an invite to use “Working Title” or to name your own theme this year. Choose to define who you are now, and select what you want to work toward. Either way, make permanent the temporary title you’ve chosen for AfrikaBurn 2018, and share your individual knowledge and experience throughout. Transform the world around you, taking the new skills and amazing concepts you’ve discovered and developed back to the communities that sparked them. Engage your neighbours, motivate your team-mates; drive positive change in all that you’re doing, and keep doing it all year round. Its the same blank canvas, just a little more open this year. An invite to ideas that are truly unique, completely unpolished, and entirely unparalleled. Create something that lasts, and create something that spreads. Create something unidentified and unknown. Create something unnameable and unmatched. Create something new. Interested in reading further on the 2018 theme? Head to this piece on our blog. Different concepts and developments of themes were submitted by members of our community following the call-out for theme submissions in May. Thereafter, members of our Theme Team sat with the content and mulled it over, until a clear direction emerged. At the same time we ask for input from Members and the Operations team via Google Docs, this is optional for these teams, but we often get nice input. The Theme Team passes their proposed theme through the directorship for approval. Pass through the directors for final approval on text. Who was The Theme Team for 2018? Brad Baard, Jano January, Monique Schiess, Nix Davies, Lorraine Tanner, and The Tim Doyle, with oversight from Robert Weinek, Samantha Bendzulla, and Isa Marques.